This world is under spiritual attack. I've always known that, believed it, even read several novels with fictional accounts, but I never quite grasped the reality of the situation until reading Satan and His Kingdom. Although I've read several books on Satan, demons, spiritual warfare, and hell, none of the other books ever grabbed me and held my attention like this one. I felt that I was getting a huge wake up call. 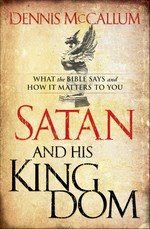 Satan and His Kingdom is a Bible based book. I loved that I could easily look up the referenced verses and study on my own. Satan is talked about in a very matter of fact way. There are no scare tactics or sensationalism here, just the scripture based facts. I have been guilty of knowing that there is a God, knowing Jesus is my Savior, but sort of dismissing Satan altogether. I get the impression I am not alone in this. This book gave me a good dose of reality, helped me learn more about Satan, and made me feel better. After all, knowledge is power. I highly recommend every Christian read this book. It is in no way a light read, all roses and sunshine, but a very real look at Satan. But, it is an important book full of great information. I feel it has given me a more balanced view of the spiritual world.